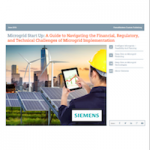 Vehicle to Grid, or V2G, technology can play a key role in a microgrid’s ability to provide grid reliability. Each electric car can send up to 10 kW of power back to the grid. Organizations with large fleets of electric cars can provide a balancing reserve to a utility – reducing the need for energy generation construction. A V2G charging station has a two-way connection that pulls in power to recharge the car’s battery and can also send electricity out to the the local grid. Electric vehicles can work like an electrical sponge, absorbing excess energy when demand for power is low, and returning some when demand is high. Here is a case study on how the L.A. Air Force base uses electric vehicle charging stations in their microgrid strategy. Los Angeles Air Force Base is a non-flying United States Air Force Base located in El Segundo, California. The base houses and supports the headquarters of the Air Force Space Command’s Space and Missile Systems Center (SMC). The center manages research, development and acquisition of military space systems. The 61st Air Base Wing provides support functions for the base. The Pentagon recently clarified plans for initial V2G tests at four military bases, with LAAFB prominent among them. 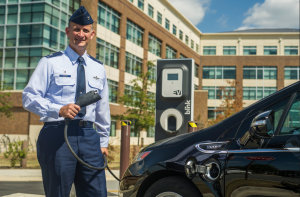 The Department of Defense (DOD) and Los Angeles Air Force Base (LAAFB) needed cost efficient and reliable electric vehicle charging solutions they could utilize on the base. Princeton Power Systems was called upon and delivered by creating the First Fleet of Bidirectional Electric Vehicle Charging Stations for the base. Concurrent Technologies Corporation (CTC) will install 13 vehicle-to-grid plug-in electric vehicle (V2G-PEV) charging stations and infrastructure at the Los Angeles Air Force Base (LAAFB) in support of the Air Force Research Laboratory. Princeton Power Systems (PPS) proposes supplying bidirectional V2G charging stations, based on its UL-listed Grid-tied Inverter (GTIB) product, that meet the technical requirements described in RFQ13-0062: Los Angeles AFB Electric Vehicle Charging Stations. The GTIB is a bidirectional, UL -1741 listed inverter with an available option for CHAdeMO compliant DC car charging that includes communications, safety features, and a hose with a connector. Over 7 MW of GTIB-100’s have been deployed, and a 30 kW (GTIB-30) inverter is currently undergoing UL-listing. We propose here a GTIB-15 model,derived from the GTIB-30 model but with a nameplate power rating of 15kVA. The 15kVA, GTIB-15-C, will be UL certified as a deviation from the GTIB-30 model, significantly reducing the time and risk of UL compliance. The scope of supply consists of 13, GTIB-15-C bidirectional charging stations with CHAdeMO DC Fast-charge option, capable of exporting power from the car to the grid. The output of the stations will be monitored and controlled by a Princeton Power Systems Site Controller that is compatible with the Open Charge Point Protocol and has built-in functionality for frequency regulation, demand response, and other grid-support features. The intent of the charging infrastructure initiative is ultimately 39 V2G-PEV charging stations that will be used in a management program to demonstrate participation in the ancillary service markets and quantify the costs and benefits. Princeton Power Systems developed 13 CHAdeMO-based charging stations using Princeton Power Systems’ UL-Certified bi-directional multi-port inverter. GTIB-30, a UL-certified, bi-directional multi-port inverter is an extremely versatile state of the art multi-port energy management converter system. The GTIB-30 can be connected to batteries, solar PV arrays, and utility grids. Unlike most conventional inverters and renewable energy systems, the GTIB-30 is designed to support and strengthen the utility grid instead of being a burden on it. The charging stations will charge the electric vehicles directly from the local utility grid enabling LAAFB personnel to utilize the electric vehicles as transportation within the base. When called-upon, and when connected to the electric vehicle, the bi-directional charging station will switch power flow directions quickly in order to support vehicle-to-grid energy request by discharging the electric vehicle’s onboard battery. In addition to supporting the reliable operation of the transmission and distribution system by providing frequency regulation, discharging the battery can also support, demand response and VAR support, among other operating modes. The GTIB-15-C charging station will be capable of servicing one V2G-capable CHAdeMO compliant vehicle, such as a Nissan Leaf. In addition to charging and discharging the Nissan Leaf, the GTIB-15-C charging station will have the ability to source power from the Nissan Leaf and supply it back to local utility in order to participate in in ancillary services market, such as frequency regulation and VAR support. The power output requested from the vehicle will be provided by an energy management system, ‘translated’ through the Princeton Power Systems Site Controller, and requested by the GTIB-15-C charging station via the CHAdeMO communications standard. As long as the vehicle can safely supply the requested power, the GTIB-15-C will respond to the signal and export power to the grid as required, adhering to UL-1741 power quality and grid-tie guidelines. Each charging station will be capable of operating as one individual unit but also be capable of properly operating in a fleet environment comprised of multiple charging stations. Aggregated operation is accomplished using Princeton Power Systems’ Site Controller. The site controller is a ruggedized PC-based hardware and software solution that allows aggregated control and monitoring of multiple charging stations, so that they can be operated as a single system. The Princeton Power Systems Site Controller has built-in control algorithms allowing the charging station system to participate in ancillary. The GTIB-15 will have the same footprint as the above and include an integrated 17-foot. cable with CHAdeMO compliant connector. It will also replace the ‘viewing window with touch screen cover’ with a larger door-integrated touch screen. The Site Controller is normally programmed at the time of commissioning to perform basic functions, and can be later upgraded and reprogrammed in the field to perform more complex functions or integrate more completely with local utility communications or SCADA systems, base building energy management systems, or other existing or future communications infrastructure. Princeton Power Systems designs and manufactures state-of-the-art technology solutions for energy management, microgrid operations and electric vehicle charging. For current microgrid updates, job postings and relevant case studies, follow Princeton Power Systems on LinkedIn. 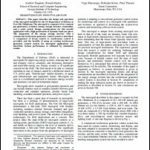 To see other Microgrid Knowledge Microgrid case studies visit the case studies channel.